Invisible Familiars have made a video for “Bestial Western,” a Can-esque song from their debut album Disturbing Wildlife which came out earlier this year. 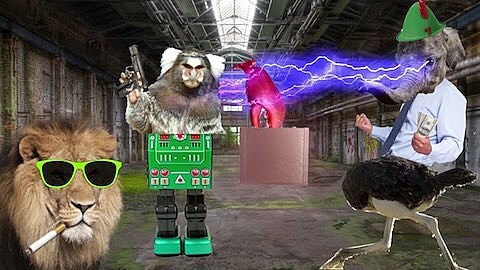 Taking cues from both the song and album’s title, director Will Schalda cut pastes animal heads (and other extremities) onto people, robots, and other animals, and animates them against backdrops of Vegas, Times Square, Jungles and outer space. It’s a glittery, psychedelic (in an Adult Swim kind of way) feast for the eyes and you can watch it below. 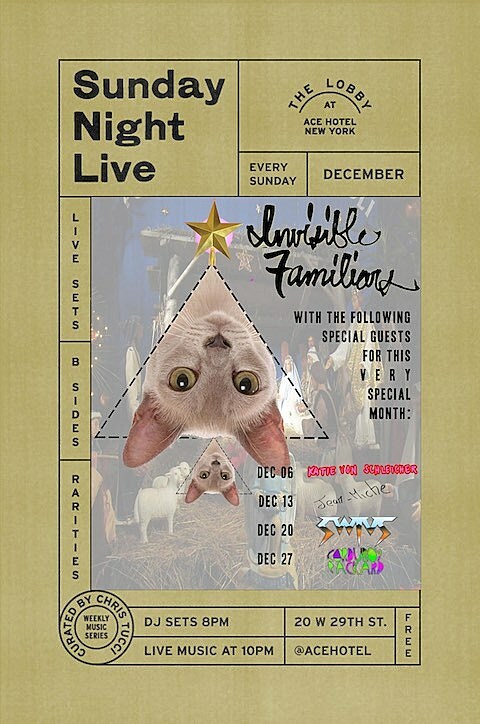 Folks in NYC can catch Invisible Familiars at Ace Hotel every Sunday night in December. The shows are free with DJ sets at 8 PM and the band at 10 PM. Each show has special guests, too: on 12/6 it’s Katie Von Schleicher of Wilder Maker; on 12/13 it’s Jean-Miche who features on some DFA alums; on 12/20 it’s Swivs, aka Will Scalada who directed the video; and on 12/27 it’s Corduroy Packard, aka Doug Wieselman who’s played with Cocorosie, Antony & the Johnsons, Lou Reed, and others. Poster for the Ace Hotel residency is below.